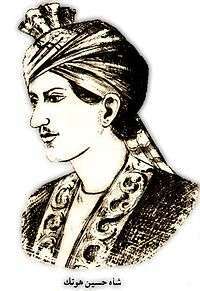 The Hotak dynasty or the Hotaki dynasty was an Afghan monarchy of the Ghilji Pashtuns, established in April 1709 by Mirwais Hotak after leading a successful revolution against their declining Persian Safavid overlords in Kandahar. 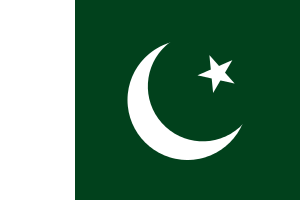 It lasted until 1738 when the founder of the Afsharid dynasty, Nader Shah Afshar, defeated Hussain Hotak during the long siege of Kandahar, and started the reestablishment of Iranian suzerainty over all regions lost decades before against the Iranian archrival, the Ottomans, and the Russians. 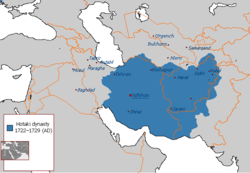 At its peak, the Hotak dynasty ruled very briefly over an area which is now Afghanistan, western Pakistan, and large parts of Iran. In 1715, Mirwais died of a natural cause and his brother Abdul Aziz succeeded the monarchy. He was quickly followed by Mahmud who ruled the empire at its largest extent for a mere three years. 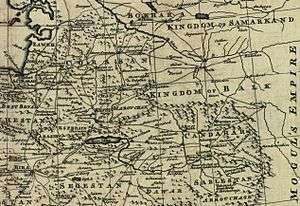 Following the 1729 Battle of Damghan, where Mahmud was roundly defeated by Ashraf Hotak, Mahmud was banished to what is now southern Afghanistan with Hotak rule being confined to it. 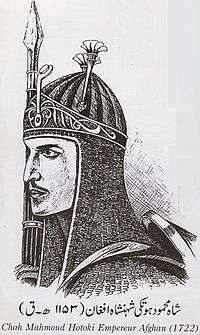 Hussain Hotak became the last ruler until he was also defeated in 1738. Kandahar province was ruled by the Shi'a Safavids as their far eastern most territory from the 16th century until the early 18th century, while the native Afghan tribes living in the area were Sunni Muslims. Immediately to the east began the Sunni Mughul Empire, who occasionally fought wars with the powerful Safavids over the territory of southern Afghanistan. 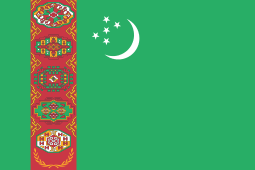 The area to the north, was controlled by the Khanate of Bukhara at the same time. 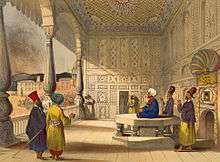 By the late 17th century, the Iranian Safavids, like their arch rival the Ottoman Turks, had been starting to heavily decline due to misrule, sectarian strife, and foreign interests. In 1704, the Safavid Shah Husayn appointed his Georgian subject and king of Kartli George XI (Gurgīn Khān), who had converted to Islam like many other Georgians under Ottoman or Persian rule, as the commander-in-chief of the easternmost provinces of the Safavid Empire, in what is now Afghanistan. His first task was to quell the uprisings in the region. Gurgin began imprisoning and executing Afghans, especially those suspected of organizing rebellions, successfully crushing the rebellions. One of those arrested and imprisoned was Mirwais who belonged to an influential Hotak family in Kandahar. Mirwais was sent as a prisoner to the Persian court in Isfahan but the charges against him were dismissed by Shah Husayn, so he was sent back to his native land as a free man. Several half-hearted attempts to subdue the rebellious city having failed, the Persian Government despatched Khusraw Khán, nephew of the late Gurgín Khán, with an army of 30,000 men to effect its subjugation, but in spite of an initial success, which led the Afgháns to offer to surrender on terms, his uncompromising attitude impelled them to make a fresh desperate effort, resulting in the complete defeat of the Persian army (of whom only some 700 escaped) and the death of their general. Two years later, in A.D. 1713, another Persian army commanded by Rustam Khán was also defeated by the rebels, who thus secured possession of the whole province of Qandahár. 1 2 Malleson, George Bruce (1878). History of Afghanistan, from the Earliest Period to the Outbreak of the War of 1878. London: Elibron.com. p. 227. ISBN 1402172788. Retrieved 2010-09-27. ↑ Ewans, Martin; Sir Martin Ewans (2002). 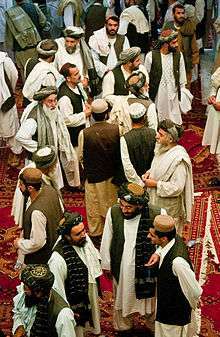 Afghanistan: a short history of its people and politics. New York: Perennial. p. 30. ISBN 0060505087. Retrieved 2010-09-27. ↑ "AN OUTLINE OF THE HISTORY OF PERSIA DURING THE LAST TWO CENTURIES (A.D. 1722-1922)". Edward Granville Browne. London: Packard Humanities Institute. p. 33. Retrieved 2010-09-24. ↑ Romano, Amy (2003). A Historical Atlas of Afghanistan. The Rosen Publishing Group. p. 28. ISBN 9780823938636. Retrieved 2010-10-17. ↑ Nadir Shah and the Afsharid Legacy, The Cambridge history of Iran: From Nadir Shah to the Islamic Republic, Ed. Peter Avery, William Bayne Fisher, Gavin Hambly and Charles Melville, (Cambridge University Press, 1991), p. 11. 1 2 Otfinoski, Steven Bruce (2004). Afghanistan. Infobase Publishing. p. 8. ISBN 9780816050567. Retrieved 2010-09-27. ↑ Runion, Meredith L. The History of Afghanistan. p. 63. 1 2 3 "AN OUTLINE OF THE HISTORY OF PERSIA DURING THE LAST TWO CENTURIES (A.D. 1722-1922)". Edward Granville Browne. London: Packard Humanities Institute. p. 29. Retrieved 2010-09-24. 1 2 "Last Afghan empire". Louis Dupree, Nancy Hatch Dupree and others. Encyclopædia Britannica. Retrieved 2010-09-24. ↑ "Account of British Trade across the Caspian Sea". Jonas Hanway. Centre for Military and Strategic Studies. Retrieved 2010-09-27. ↑ "AN OUTLINE OF THE HISTORY OF PERSIA DURING THE LAST TWO CENTURIES (A.D. 1722-1922)". Edward Granville Browne. London: Packard Humanities Institute. p. 31. Retrieved 2010-09-24. 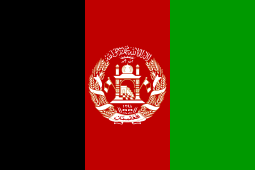 ↑ "AFGHANISTAN x. Political History". D. Balland. Encyclopaedia Iranica. Retrieved 2010-09-24. Wikimedia Commons has media related to Hotak dynasty.